UConn Provost Mun Choi speaks at the February 25 event with UTAS officials and Governor Dannel P. Malloy watching. A version of this story originally appeared on the MSE Website. With the launch of a new materials and process-engineering (MPE) lab, UTC Aerospace Systems (UTAS) has also announced a materials engineering Center of Excellence opening for collaboration with UConn. Governor Dannel P. Malloy was present at the official announcement on February 25, as he toured the new $8 million facilities with Provost Mun Choi and several other executives and engineers. Made possible by both private and public investments, the lab will expedite work done by researchers at the high-technology aerospace parts company, making it easier to keep pace with constantly changing technology and promoting more advanced work than done before. 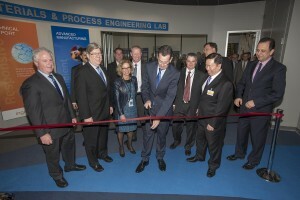 Governor Dannel P. Malloy cuts a ribbon at the new UTAS lab. 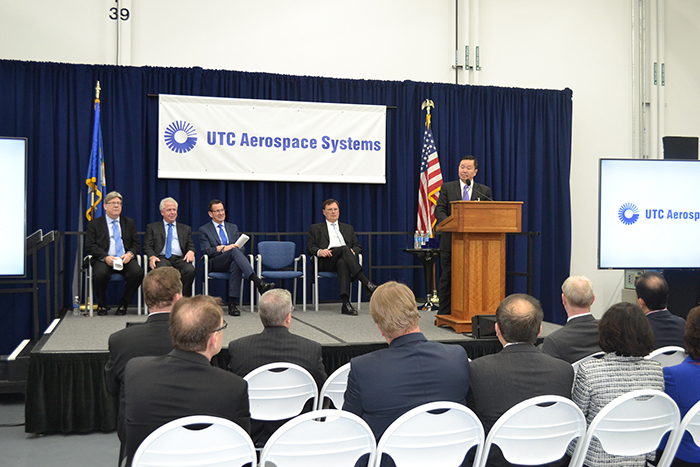 Front from left to right in the very front is Dave Carter, Senior Vice President, Engineering, Operations and Quality, UTC Aerospace Systems, J. Michael McQuade, Senior Vice President of Science and Technology, United Technologies, Malloy, and UConn Provost Mun Choi, with other prominent United Technologies officials and dignitaries present. As a part of this effort, UTAS will provide a 5-year commitment of $200,000 per year in advanced research in Materials Science and Engineering (MSE) and the Institute of Materials Science (IMS) at UConn, as well as funding for undergraduate education in terms of several MSE co-op positions and senior design projects. 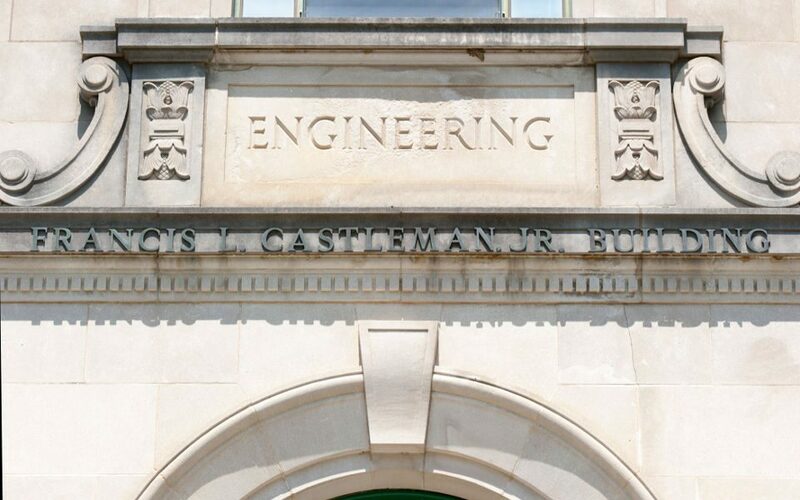 The new UTAS Center for Advanced Materials will cover major topic areas such as Materials Genomics, Materials Characterization, and Advanced Manufacturing. 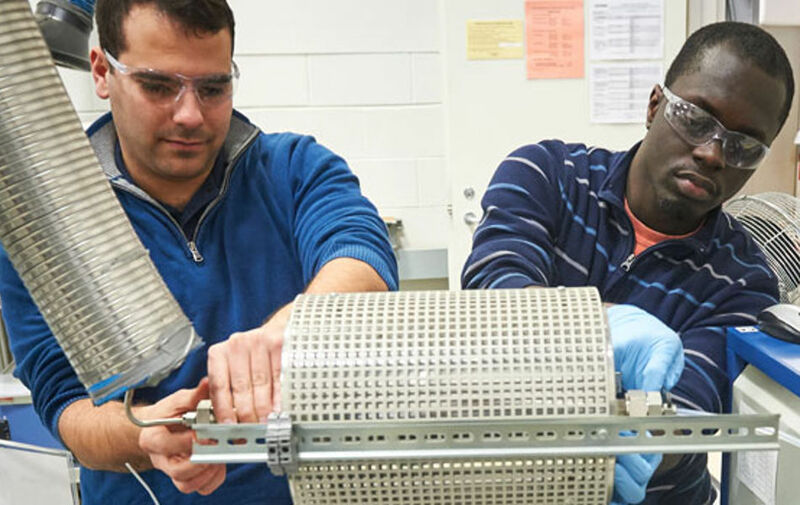 UTAS engineers and scientists will work with UConn students on additive manufacturing, materials-by-design, high temperature composites, and other advanced materials. Professor Rainer Hebert, MSE, said that the center will allow UConn students to have firsthand interactions with industry, which provides a real benefit to their career prospects. “Students get to see how industry thinks about research, how even when they’re interested in a science, there’s always an application in mind,” Hebert said. The Center will be managed by several distinguished members of the UConn MSE and IMS faculty including Mark Aindow, Professor of MSE and Associate Director of the IMS, Hebert, who is also the Director of the Additive Manufacturing Innovation Center, and, Steven Suib, Director of the IMS and a Board of Trustees Distinguished Professor in the Chemistry Department. Dr. Pamir Alpay, Head of MSE, will act as Director of the Center. He shares in the excitement for the opportunities that the facility provides.